The Saints lost to the Rams in overtime. They likely would’ve won in regulation if not for this mistake. The NFL’s pass-interference rule is always enforced with varying rigor. Some days, defensive backs have a bit more latitude than others to hit receivers before the ball arrives. Maybe one week, a slight shove a half-second before the ball arrives is fine, and the next week, the same shove gets called. It happens in a high-speed, high-contact sport. Tommylee Lewis was running a little wheel route on third-and-10 from the Rams’ 13-yard line, with the score tied at 20 in the final two minutes of the NFC Championship. He was about to catch it just shy of the first-down marker when Robey-Coleman annihilated him. There’s a decent bit to the PI rule, but the biggest thrust of it is that “contact by a player who is not playing the ball that restricts the opponent’s opportunity to make the catch” is not allowed. Well, that means you can’t destroy a receiver well before the ball arrives if you, yourself, are not looking at the ball or making any effort to catch it. Had Robey-Coleman been paying closer attention, he probably could’ve cut the route, intercepted Drew Brees’ pass, and run about 90 yards the other way. The consequences, of course, turned out to be huge. The best the Rams could’ve reasonably hoped for would’ve been to get the ball down with less than a minute left and no timeouts, trailing by 3. Instead, the Saints got a 31-yard field goal from Will Lutz to go up 23-20. The Rams countered with their own field-goal drive immediately after that, bringing up overtime. Greg Zuerlein connected again in OT, on a 57-yarder after a Drew Brees interception, to get the Rams to Atlanta. Sean Payton noticed, telling reporters afterward he hoped no team had to lose like that again. 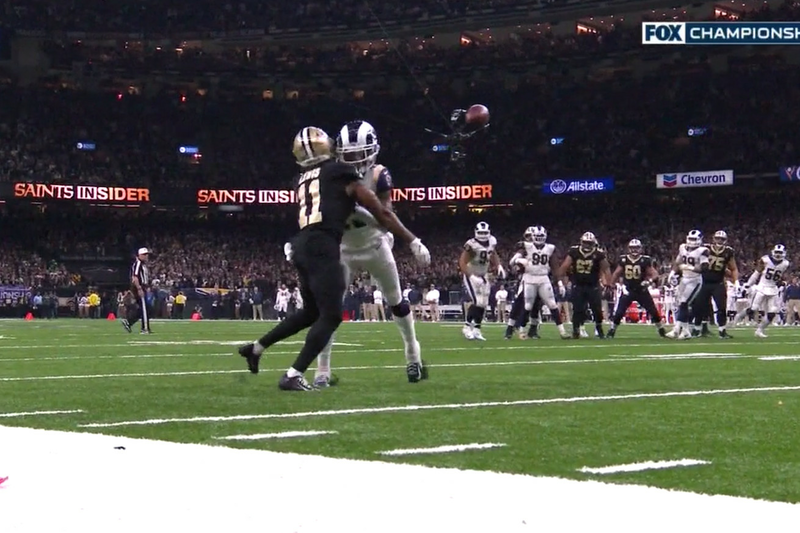 The Saints had other chances to win, but it will sting for a long time that they probably would have anyway if the correct call had been made here.